This is going to be an exciting year for MozBar. I’m happy to announce that we’ve got something new that will help you save a ton of time tuning your on-page SEO. We’ve added Page Optimization to MozBar Premium! If you want to dive right in, download MozBar for Chrome. 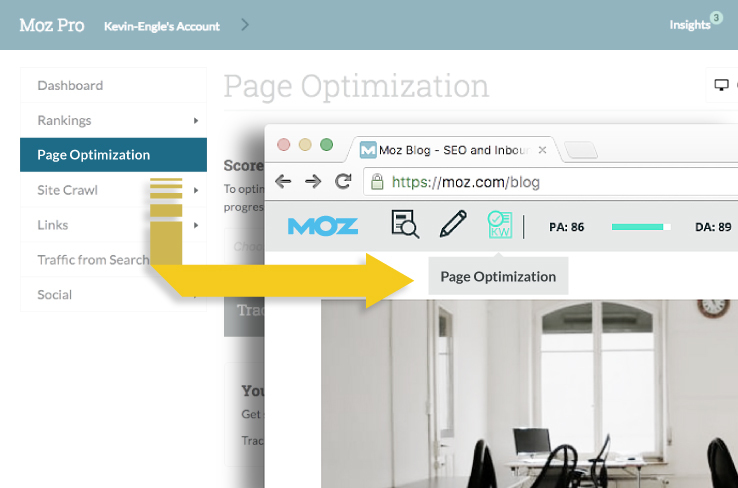 To access the Page Optimization feature, you’ll need to be logged in to your Moz Pro account. If you don’t have a Moz Pro account, you can take a free 30-Day trial to check out all the new goodies. Currently in Moz Pro, you can run a Page Optimization report for any of your tracked keywords and campaigns to get detailed information on how to optimize your page for a keyword, and where you’re getting things right. We’ve taken this functionality and put it in the MozBar — except now you can check on-page optimization for ANY keyword on ANY page, not just ones you’re tracking. It’s like having Moz Pro on-the-go. As always, the keywords and pages you research via MozBar are limitless — that’s right, they won’t affect any of your limits in Moz Pro. 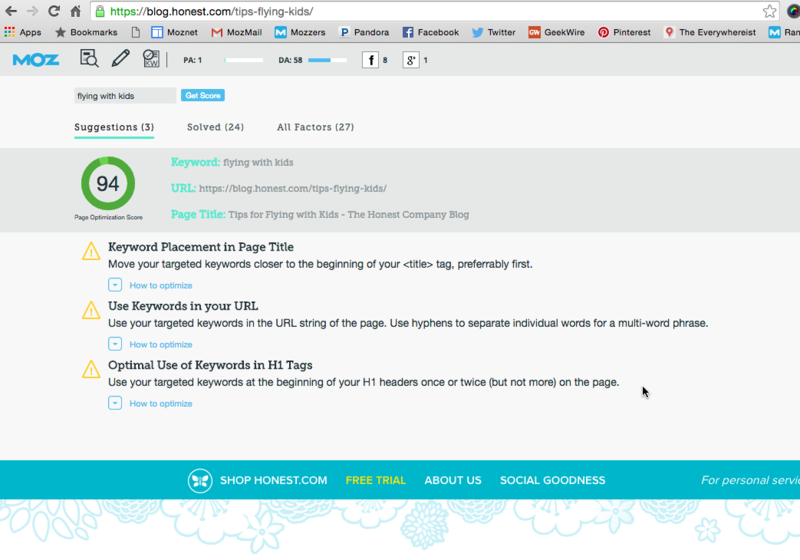 You now have the flexibility to check any keyword on any page. This opens the door to tons of new ideas for page optimization, paving the way for you to rank higher in the SERPs. Quickly check any page on your site for keywords you’re tracking and see how optimized (or not) your page is for target keywords, in real time. You’ll also get detailed suggestions on how to optimize your page. This can help you decide whether or not a keyword is worth optimizing for, or maybe you’ll find you’re already doing a great job and can move on to the next one. I’m always on the lookout for an article with good parenting tips, especially when it comes to traveling with children. 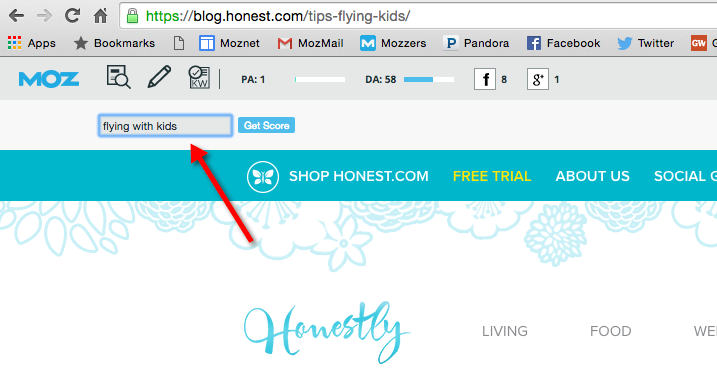 I like the Honestly blog by the Honest Company, so let’s use this post about flying with kids as an example of how to optimize your page using MozBar. Let’s say I’m targeting the keyword “flying with kids” and want to see how well this page is optimized. I chose this keyword because it feels like a query that can be answered by the content well, and after researching it in Keyword Explorer, I found that it has good search volume and a good Potential score. 1. First, we’ll open MozBar on the page. We’ll click on the new Page Optimization icon next to the Highlight tool. 3. Looking good! This page has a Page Optimization Score of 94 out of 100, which is great. There are three suggestions for improving this score even more, such as adjusting keyword placement in the page title and using targeted keywords in the H1 headers periodically on the page. Overall, a pretty well-optimized page! Review competitors’ pages: Another benefit of being able to check any keyword + page URL combo is that you can see how well your competitors are optimizing for certain keywords, too. This insight could help you learn which keywords your competitors optimize for and how. Improve client proposals: Prospecting for potential clients has gotten easier, too. Now you can audit a prospect’s pages and find opportunities for on-page optimization improvement — a valuable resource for any SEO putting together a site report for a potential client. For each keyword + page URL combo you check, you’ll get a Page Optimization Score, just like in the campaign-based version of Page Optimization in Moz Pro. The Page Optimization Score is a metric we use to gauge how optimized a page is for the keyword you’ve paired it with. We take twenty-seven contributing factors to a well-optimized page and score your page for that particular keyword. We’ve broken down your score by Suggestions (items you may want to tweak or optimize) and Solved (a list of factors that are positively influencing your score). You’ll get the full list of both Suggestions and Solved factors that contribute to your score under the All Factors tab. We also highlight the highest-priority items under Most Important Fixes. If you need more insight, expand the suggestion and you’ll get real advice from one of our SEO experts. And we’ve got another cool feature on the horizon. We’ll be adding Related Topics to MozBar very soon. In addition to all the data you get from Page Optimization, Related Topics will surface a list of popular topics that your audience may be in interested in based on other topics that appear in the SERP. You’ll also see the pages that talk about those topics. Pretty sweet! You can start using Page Optimization in MozBar Premium today with your Moz Pro subscription, or try it free for 30 days. Also, starting today, you’ll need to be logged in with either your Community account or your Moz Pro account to access link metrics. Read more about it here in my Q&A post. Enough talk — I want to download MozBar! Give Page Optimization for MozBar Premium a spin today, and as always, we’d love to hear what you think of it!